Want to be a morning person?! Do this before making your coffee! Coffee and chai combine forces to make one perfect cup of caffeine. 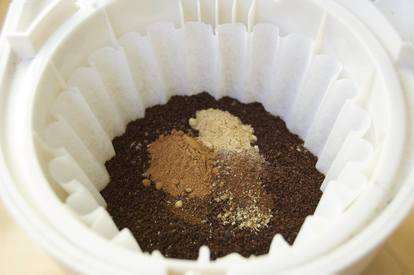 If you love ordering dirty chai lattes (chai tea, steamed milk, and a shot of espresso), you're going to want to try out the trick to getting a similar taste at home: add all the chai spices to your coffee filter before brewing the coffee. The spices mix well with the coffee grounds, and the resulting brew is wonderfully aromatic (seriously, the smell alone is reason enough to make this).